The events in 21 are partly inspired by Ben Mezrich's novel Bringing Down the House: The True Story of Six M.I.T. Kids Who Took Vegas for Millions. Jim Sturgess stars as Ben Campbell, an M.I.T. student who has already been accepted to the college of his choice - the only thing standing in his way is the financial funding. 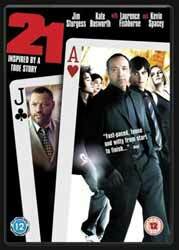 So, when one of his lecturers, Micky Rosa (played by Kevin Spacey), realises that Ben is good with numbers, he recruits him into his team of students who fly to Vegas every weekend and win a fortune at the Blackjack tables - thanks to their card counting system. Initially Ben agrees to participate just until he's won enough money to pay his college fees, but as he gets sucked into a new life, where anything goes, getting out is not as easy as he thought. Hot on the gang's tail is Cole Williams (played by Laurence Fishburne), a security chief whose job it is is to spot card counters. While the gang has done nothing wrong, Cole can't help feeling that they are up to something, but he needs proof that there is a team working together. Extras include an audio commentary (with director Robert Luketic and producers Dana Brunetti and Mike De Luca. Highlights include an explanation of how the opening sequence was filmed; them pointing out what looks like a one-legged stripper; the brief appearance of Mr Slots; and the explanation of an alternative ending which would have included yet another twist); The Advantage Player (5 min, 13 sec look at the history of Blackjack and the basic strategy that if you stick with should allow you to beat the dealer); Basic Strategy: A Complete Film Journal (23 min, 48 sec behind the scenes featurette); Money Plays: A Tour of the Good Life (6 min, 51 sec additional behind the scenes footage with cast and crew interviews) and trailers for other releases. With twists and turns aplenty, even if this was released for £21, I bet you'd still thoroughly enjoy it.